A by-election to choose an MP for Newport West will be held on 4 April. 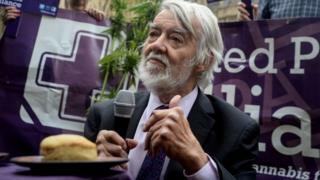 The opposition's chief whip, Nick Brown, moved the writ in the Commons to trigger the contest to replace Paul Flynn, who died aged 84 this month. Labour MP Mr Flynn - a widely respected figure who was briefly a member of the shadow cabinet - had represented Newport West since 1987. He won a 5,658 majority over the Conservative candidate in the 2017 general election. Mr Brown told MPs: "I beg to move that Mr Speaker do issue his warrant to the clerk of the crown to make out a new writ for the electing of a member to serve in this present Parliament for the county constituency of Newport West in the room of Paul Flynn deceased." Speaker John Bercow repeated the request, which MPs approved. The by-election will take place days after the UK's scheduled departure from the EU on 29 March. Mr Flynn had campaigned for Remain during the 2016 EU referendum, but Newport voted to leave. On the news of his death last month, tributes poured in from his Labour colleagues. Labour leader Jeremy Corbyn described his "good friend" as an independent thinker who was a credit to the party, while Wales' First Minister Mark Drakeford said he was a "giant of the Welsh Labour movement". Welsh Labour leader Mr Drakeford said: "He was one of the most effective communicators of his generation - inside the House of Commons and outside." Announcing his intention to quit politics in October, after becoming confined to bed because of rheumatoid arthritis, Mr Flynn said he was very frustrated not to be taking an active role after three decades. He campaigned on a wide-range of issues, including benefits, animal welfare and devolution. And he briefly served on the opposition front bench in 2016 after a string of MPs quit the shadow cabinet in protest at Mr Corbyn's leadership.